The wind bashed us about last night. Jan mentioned we might lose some of the gear on the cabin roof which meant I had a broken night and little sleep listening to every bounce, rattle and moan. imagining the wind tearing our solar panels or poles from the roof. I almost got up three times during the night to lower the TV mast. In the morning I was relieved to see everything was OK. However the “hurricane” heading actually refers to the first 1000 hour service of the Hurricane Central Heater. The heater manual stated the service was easily done and proved to be correct. The first step was to ensure the heater power supply was off. Next the six screws holding the front face panel were removed and the panel carefully pried off the heater. It has an airtight rubber seal on the inside as the heater is actually pressurized when in use. Removing the panel exposed the fuel atomizer (jet) and igniter. These were easily removed from the burning chamber. 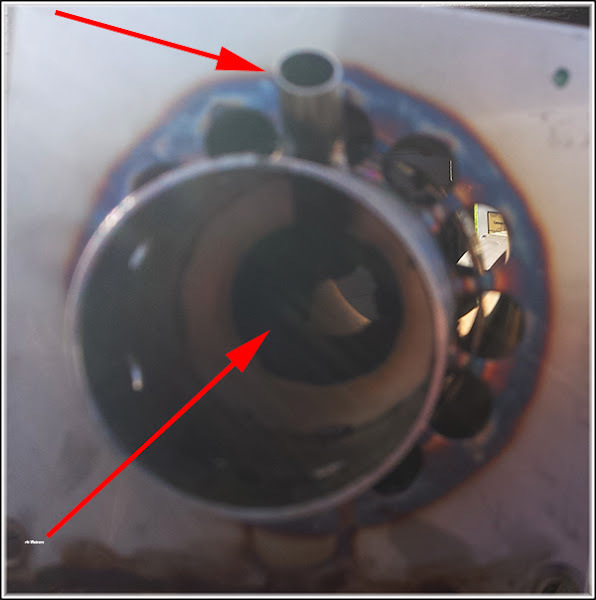 The combustion chamber is then removed by undoing the four brass nuts holding it in place. The stainless steel combustion chamber. The small tube sticking out at an angle is the receiver for the igniter. Fuel is sprayed in at the left end under pressure and ignited where it burns in the combustion chamber. I was quite surprised to see how little carbon had built up inside the chamber. Unfortunately it’s rather hard to see in the next photo. It’s possible to see the hole in the middle of the chamber has some carbon deposits around the edge. A light tap on the ground dislodged all the carbon. The second half of the combustion chamber (the half inside the heater) was then vacuumed clean. I was also surprised at the size of the fuel filter. It’s about 2/3 the size of a cigarette filter. 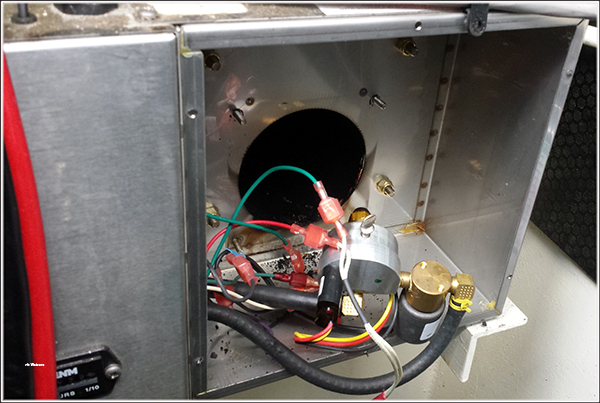 After the combustion chamber was reassembled the side panel was removed (three screws) and the air filter checked. It looked to be in good condition. The heater was then started to check it worked. The job took about an hour and can be done by the owner. It has taken three years to reach 1000 hours so the chances are it’s a simple job that wont have to be repeated until 2017. I’m very pleased with the Hurricane. It’s more expensive than the Webasto, Mikumi or Eberspacher, but IMHO it’s more reliable, and the ongoing maintenance costs are significantly lower. We had a hurricane fitted to Caxton. As you say it was so simple to service and is such a simple reliable heater. Thanks for the description and photos. Does not look too complex so will give it a go, in about 2 years time. There’s a hole in the bucket dear Liza… A hole! I’m a lumberjack and I’m OK?